This year, my go-to neighbor gift is peppermint popcorn which is divine and easy to make. I needed an equally as simple gift bag to put it in. I ordered 4 inch doilies from Amazon, although any respectable craft store will have them. 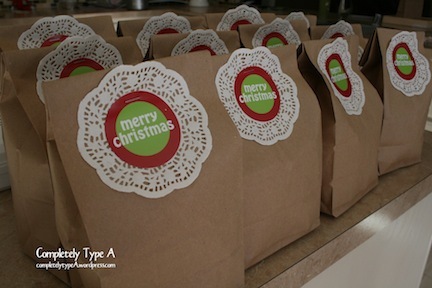 I designed a little “Merry Christmas” tag and stapled it all on at once onto a brown lunch bag. You could also use “To/From” tags instead. I love easy.